In a book that fundamentally challenges our understanding of race in the United States, Neil Foley unravels the complex history of ethnicity in the cotton culture of central Texas. This engrossing narrative, spanning the period from the Civil War through the collapse of tenant farming in the early 1940s, bridges the intellectual chasm between African American and Southern history on one hand and Chicano and Southwestern history on the other. The White Scourge describes a unique borderlands region, where the cultures of the South, West, and Mexico overlap, to provide a deeper understanding of the process of identity formation and to challenge the binary opposition between "black" and "white" that often dominates discussions of American race relations. In Texas, which by 1890 had become the nation's leading cotton-producing state, the presence of Mexican sharecroppers and farm workers complicated the black-white dyad that shaped rural labor relations in the South. With the transformation of agrarian society into corporate agribusiness, white racial identity began to fracture along class lines, further complicating categories of identity. 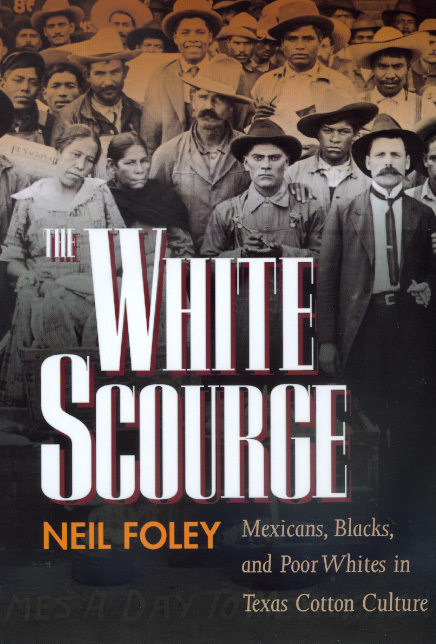 Foley explores the "fringe of whiteness," an ethno-racial borderlands comprising Mexicans, African Americans, and poor whites, to trace shifting ideologies and power relations. By showing how many different ethnic groups are defined in relation to "whiteness," Foley redefines white racial identity as not simply a pinnacle of status but the complex racial, social, and economic matrix in which power and privilege are shared. Foley skillfully weaves archival material with oral history interviews, providing a richly detailed view of everyday life in the Texas cotton culture. Addressing the ways in which historical categories affect the lives of ordinary people, The White Scourge tells the broader story of racial identity in America; at the same time it paints an evocative picture of a unique American region. This truly multiracial narrative touches on many issues central to our understanding of American history: labor and the role of unions, gender roles and their relation to ethnicity, the demise of agrarian whiteness, and the Mexican-American experience. Neil Foley is the Robert H. and Nancy Dedman Chair in History at Southern Methodist University. Robert G. Athearn Book Award for the best book on the twentieth-century American West, Western Historical Association.